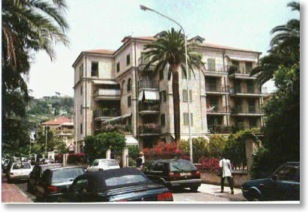 Bordighera today retains but a shadow of its former grandeur. The town, a few miles from the French border on the Italian Riviera, has spread toward the sea and expanded along the coast merging with the neighbouring Ventemiglia. Further inland are the large hotels, but the English and other northern visitors have long since departed allowing the town to revert to the local inhabitants. The most conspicuous sign of past glories, apart from the architecture, is the thriving tennis club just up the road from MacDonald's former home. MacDonald's villa, the Casa Coraggio, still stands adjacent to the English Church. It has had an extension built and a further storey added but the more rugged outline of the original is clearly distinguished. It is now a number of apartments each with its own balcony embellished with flowering plants. Whether MacDonald's Grand Salon (which was capable of seating two hundred persons or, at a push, four hundred and fifty standing) or the magnificent marble staircase remain I doubt and the Scotch firs he planted in the garden have since been dwarfed by the native palms. He has not been forgotten though and a marble plaque erected in 1986, acknowledges that this was once the writer's home. 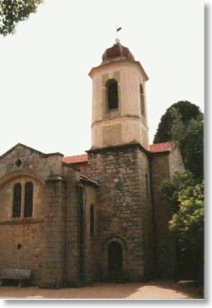 The English Church (Chiesa Anglica), where MacDonald's wife Louisa delighted to play the organ and the girls of the family sang in the choir, is now a cultural centre, with it's gates securely padlocked and an undergound car park being constructed underneath with the entrance at the side of the church. All that is visible through the high wire fence is the tower with the entrance door beneath and the stained glass windows. It is good to see that the building is still serving the local community although sad that it is no longer fulfilling its original function. 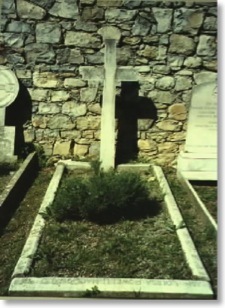 MacDonald's ashes lie buried in the English cemetery, along with his wife Louisa and daughters Lilia and Grace. This is a few miles from the English Church near the old town. It lies on a slope of a large hill with palm trees behind and above the cemetery. The front wall of the cemetery is a high white stone wall and MacDonald's grave is towards the back along the rear stone wall. As is so often the case the reality is something of an anticlimax. In my minds eye I had held a romantic image of the house set high above the sea and the writers study still lined with books, looking as if he had but for a moment departed, but time stands still for no one and perhaps this is as it should be. 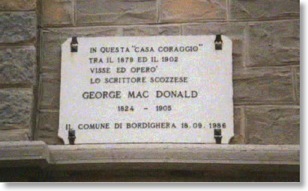 George MacDonald's best memorial is his work and the influence it still has for the good in his readers lives. I believe he would have wished it no other way.